Emily Weddall’s great great grandfather Daniel was the son of William and Elizabeth Graisberry, was born at Drumcondra, Dublin in 1740. He studied and completed his apprenticeship under the King’s Printer, Hugh Greirson. Newly qualified Daniel Graisberry formed a partnership with a man named Williamson, at 10 Back Lane. 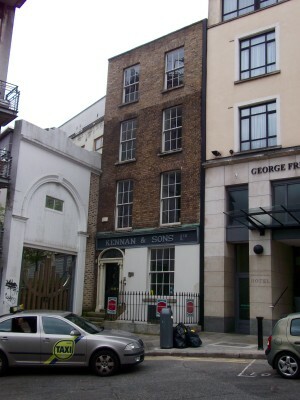 The address is no longer in existence, but according to the maps of the time it was around the Christ Church area of Dublin. Mr. Daniel GRAISBERY, Printer to Miss KENNEDY, with a handsome Fortune. In 1782 a curious incident occurred, Daniel Graisberry was injured when the floor of the Music Hall in Fishamble street collapsed, during a guild meeting. By the time the press got the story his condition was grossly exaggerated and his death was announced in the newspapers. He lived on and was father to at lest a dozen children, his son Daniel (probably his eldest son), would become his heir and Emily’s great grandfather. Daniel Graisberry died in 1785, just hours after his mother. This entry was posted in Family, History, Places on May 18, 2015 by Maria Gillen.